There are folks among us who believe, “There ain’t no such a thing as a free lunch” but for fishermen in the know, we know that ain’t so. Between Scott Travers and Jessica Pena with their DEM programs and Steve Medeiros with his relentlessly generous Rhode Island Saltwater Anglers Association, the next few weeks are rich with free events offering you free tackle, free fly tying lessons, free fishing and yes, a free lunch. Lots of young fisherman and woman, aged three through fourteen, were ready to fish at South Kingstown’s Old Mountain Field for the 2018 Kids Free Fishing Derby. RISAA volunteers helped ready the rods, give a few casting lessons and set the hook for hungry trout, perch or possibly even catfish. The most amazing Elisa Conti Cahill of Snug Harbor Marina fame worked with Regal Bait to once again provide a batch of cold but hearty Canadian worms, which apparently arrived without tariffs or Twitter insults. The Derby is a fun few hours for the kids who benefit from volunteers who fish and enjoy teaching young people the pleasure of being on, or at least around, the water. Indian Run Reservoir is fed by a winding, largely hidden stream flowing from Indian Lake which spills out over a horseshoe dam into a small stream leading to the Saugatucket River, a critical waterway for an annual Spring river herring migration run. Herring work their way up the river into Peace Dale Pond and eventually, into that same Indian Lake. RISAA recently contributed $15,000 to help improve the herring runs there, which is not surprising, considering how true they stay to their mission of preserving and protecting local waters and fishes. It’s exciting to watch kids watching bobbers, seeing families spread out on the grass while their children line up on the reservoirs edge. We’ll bring you all the cool details in the next Fish Wrap. Saturday, June 23 is Ladies Fly Fishing Day at the Carolina Trout Hatchery and again proving that old adage incorrect, there is indeed a free lunch. The Recreational Boating and Fishing Foundation estimates about 31 percent of the approximately 6.5 million people in our country are fly fishers are women. Some studies show that women are indeed the fastest growing segment of fly-fisherfolk although still others say they’re the only segment growing at all. Nonetheless, DEM does a consistent and wonderful job setting up workshops like this, typically with little or no cost to the participants. Also sponsored by local chapters of Trout Unlimited, the Wood River Fly Fishing Association and the United Fly Tyers of Rhode Island, instructors will offer fly tying instruction, help with the basics of casting and provide necessary equipment to try those new flies and skills in a stocked pond. These classes, like other frequent Aquatic Resource Education programs DEM offers throughout the state, tend to fill up quickly. The day runs from 9 a.m. to 3 p.m., contact Jessica Pena at Jessica.Pena@dem.ri.gov or at 401-539-0019 to register. So now that we’re over that free lunch thing, how about three free lunches? For three days in June, RISAA again steps up to the plate, or the helm as it were, for their Youth Fishing Camp based on the historic fishing grounds of Warwick’s Rocky Point Park. This is a totally free event for young people aged seven to twelve who might have a decent background fishing for this or that or who haven’t spent much of any time developing fishing skills. Everyone is equal at this camp. For those readying an eye roll at the thought of bowline lessons, camp food and three days of retirees with three day beards and bad backs leaning in and barking about how you’re not listening, this camp is different. RISAA counselors help young people with real real life skills that carry into adulthood, which might possibly include knot tying, compass headings, the basics of how a rod is constructed, what bait works best in different conditions, even appreciating how sun and moon travel across the skies naturally affecting fishing and weather. Why the hell should I know how to tie a knot? These might be critical thinking skills later in life. The first day covers boating safety, types of tackle and marine biology with not just a free lunch, but a catered lunch. Day two starts with a sweet motor coach ride to Pt. Judith for a few hours on the fishing grounds aboard the Seven B’s and, yet again, a free lunch. The third day is all about RISAA members bringing their own boats to take everyone fishing on Narragansett Bay. 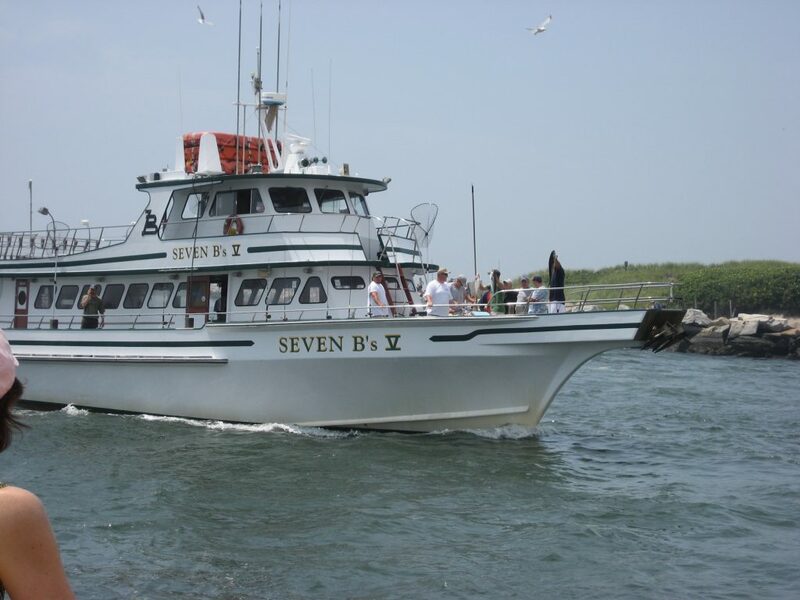 Chances are excellent that campers will catch sea bass, stripers and bluefish and the occasional fluke, then return to Rocky Point for, wait for it, a free lunch and graduation ceremony with certificates and a few laughs. With a maximum of fifty children, camp runs from 8:30 AM to 3:30 PM each day. You can register online at https://www.surveymonkey.com/r/2018FishingCamp and if you have questions, send an email to FishCamp@risaa.org or call the RISAA Office at 401-826-2121. Possibly one of my favorite pictures ever. Casting class at the RISAA fishing camp. So sign up, get on the water and give up on that old adage, ‘cause it ain’t true. Todd Corayer is a lifelong fisherman who lives not far from Rhode Island’s Saugatucket River with his wife, who supports his fishing mainly to get him out of the house and a young son who catches more fish than him. Enter your email address to follow Fish Wrap so we can send you our latest posts by email. Fish Wrap River Herring Return! what makes fishermen so special. and fun. The big day is here... Grab the kids, let's go catch some trout!